Port A Escapes was very accommodating. We had a great experience at Anchors Away! 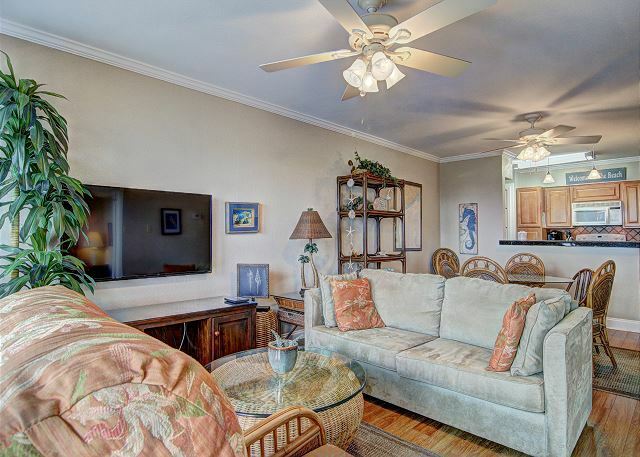 The condo was clean, nicely appointed, and was located ideally close to the beach with a beautiful view from the balcony. We can't wait to go back! If you wonder (as i did) whether you should come to Port A, the answer is YES. They are still recovering, but the condo was great and the beach was beautiful. 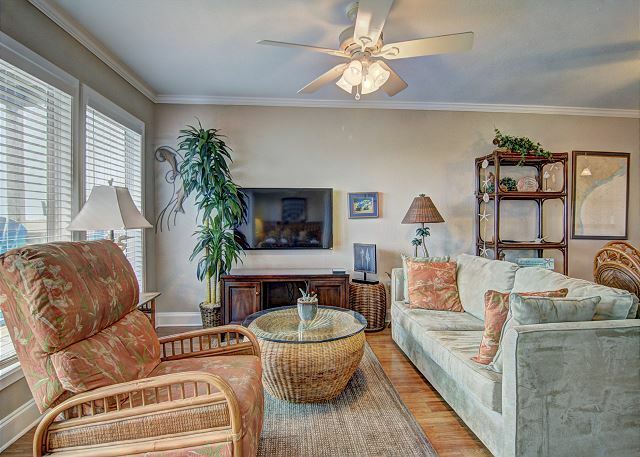 This condo has an incredible view of the Gulf and is well maintained. we were facing the beach from the patio and it was a beautiful view. 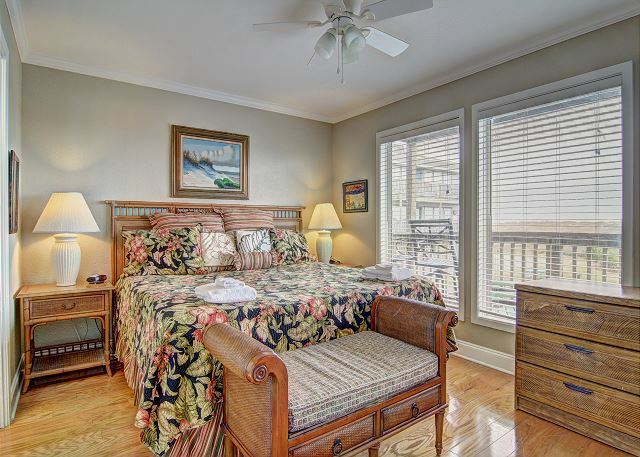 Location of condo unit was great - closest to the beach and had a great view from deck. . Condo nicely furnished, beds were comfortable, everything was clean. People at Port A Escapes were very helpful . Coffeemaker was broken. Thought the couch was a sofa bed; it is not. MBR could use some back out drapes, there are dusk to dawn lights right outside. (or bring a sleep mask) Traffic was heavy delaying our arrival to 5:03 pm. So had to drive across the hiway to get the keys. Thought they were going to wait a few minutes for us but nope. Other than that it was absolutely Heaven and we can't wait to come back. It was quiet, relaxing, everything we needed. bring an aux cable it you want to stream video or listen to music. There is a blender tho it's not mentioned. bring your own "church key" if you need to open cans for pouring. Would highly recommend. Will be back! 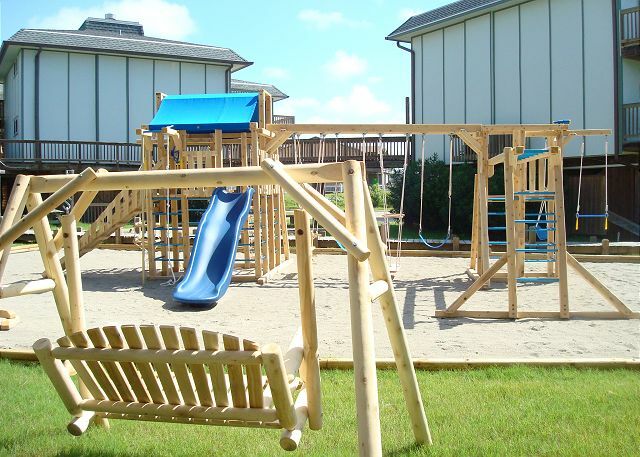 Our family found the facility well maintained and in an ideal location. Anchors Away 503BH was clean and in good condition. Rooms were spacious, and the very wide veranda provided a stunning view of each day's sunrise. The Port A app made checking in and out a breeze. We are glad to hear you enjoyed your condo along with its view. 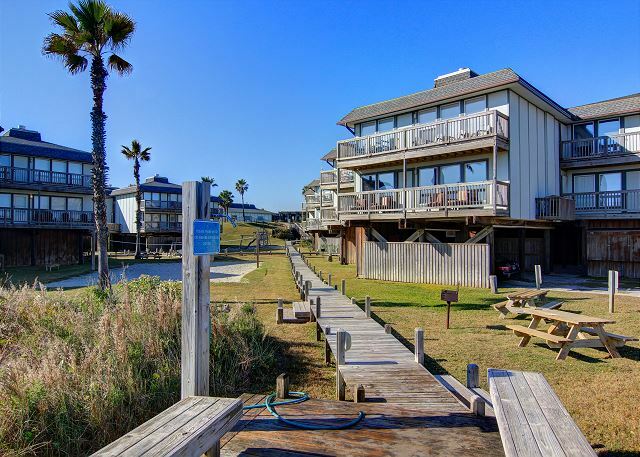 Give us a call when you are ready to come back to Port A. Overall it was great, the only issue I would bring up is wi-fi reliability, it did not seem consistent throughout the property. Nice quiet place. Really enjoyed the balcony and the boardwalk to the beach. The condo was clean and comfortable. I will definitely try to stay there again. Stayed three nights at unit 503 at Beachhead. enjoyed the proximity to the beach and to town. Property was as expected. The unit we stayed in could use a little maintenance with some rust(expect some of course). Door to the balcony needs some repair and maintenance. Overall the unit was clean and met our needs. We've stayed at Beachhead many times when visiting PortA, but the first time in this particular unit (love the convenience of Beachhead with their direct boardwalk access to the beach, hoses and outside shower for getting the sand off everything and boardwalks to everything like the pool and back to your units. This unit was very clean, no carpet. Faces the water in one of the front units and is on the same level as the pool (so you can take the bridge across the unit closest to the pool and straight through to this building -- very convenient). It is however NOT on the top floor, so you can hear footsteps of the people above you. This unit had everything we needed to cook all our meals there, although no storage containers for leftovers (we always bring our own). 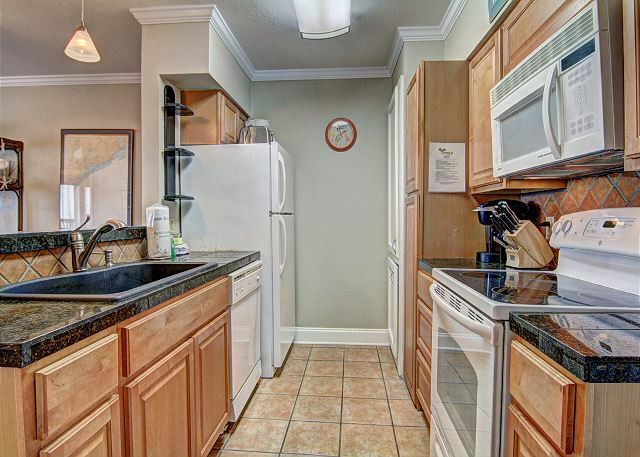 There's no disposal in the sink, but does have the dishwasher, microwave, electric stove. 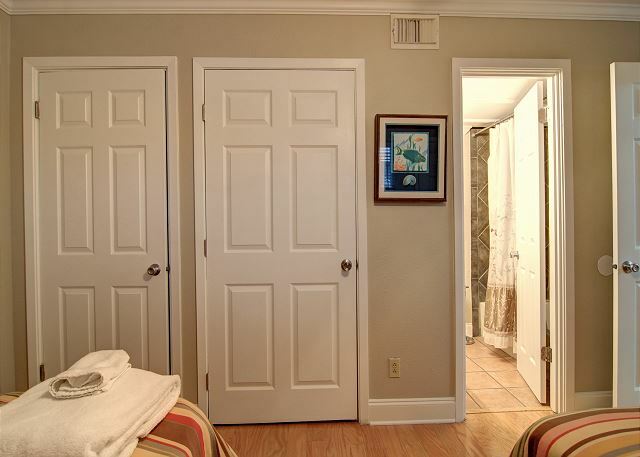 The layout of the unit worked great for our family of 4 -- 2 twins in the front bedroom with their own bathroom and the master in the back with our own bathroom. Cable and wifi worked great too. 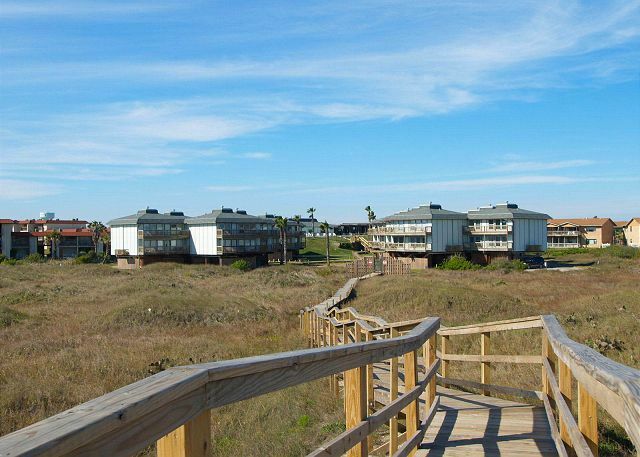 We've stayed at beachhead condos a number of times and had a great experience every time. Only dislike is no pets policy. Stayed in unit 503 for over 24+ years! Loved the updates! Gorgeous and so appreciated. Especially enjoyed the tall stools/table combo on the deck for eating lunch and drinking wine. The Beachhead is never a disappointment! Port A has so much to enjoy: UT Science Ctr;bird-watching trails/parks.Ship-watching;dolphin watching boat rides and so much more! OUR CONDO WAS GREAT. 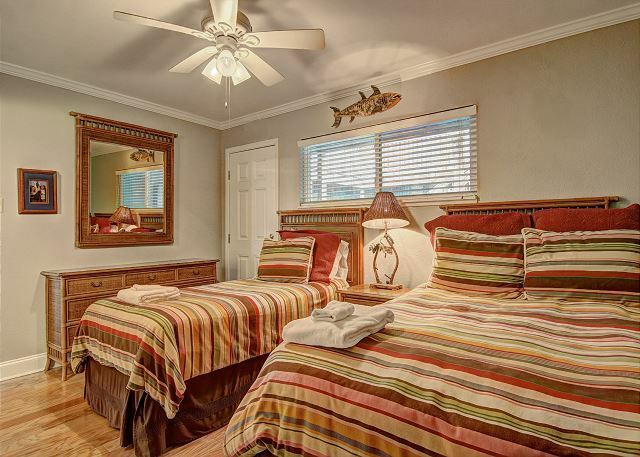 NEWLY REMODELED, COMFORTABLE AND VERY CLEAN. THE GROUND WAS VERY WELL MAINTAINED AND ROOMY. THE LARGE POOL WAS NICE AND VERY CLEAN. I HOPE TO BE ABLE TO STAY THERE ON ANY FUTURE VISITS TO THE AREA. I WOULD RECOMMEND TO ANYONE. I LOVE THE CONVENIENCE OF BRAUN'S CARTS BUT A LITTLE COSTLY. SKUTTLEBUTT'S BAR & GRILL WAS DELICIOUS. Great Quaint property with a relaxing view! We recently stayed at this property for Spring Break. 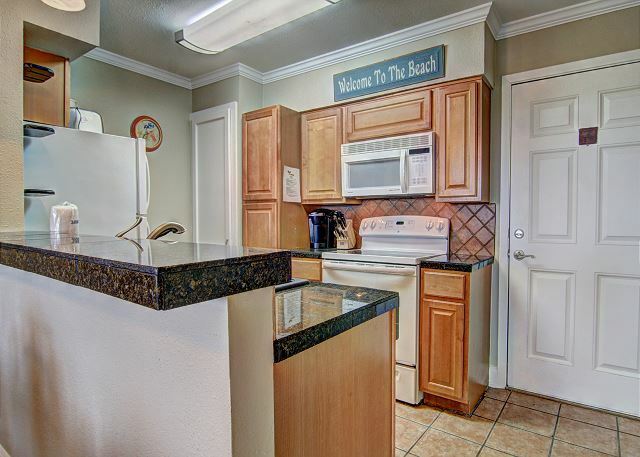 As adult vacationers, it was important to us to have easy beach access, great relaxing views and full kitchen/bbq amenities. The rental is well maintained. There was four of us and we were comfortable. I would recommend this unit. 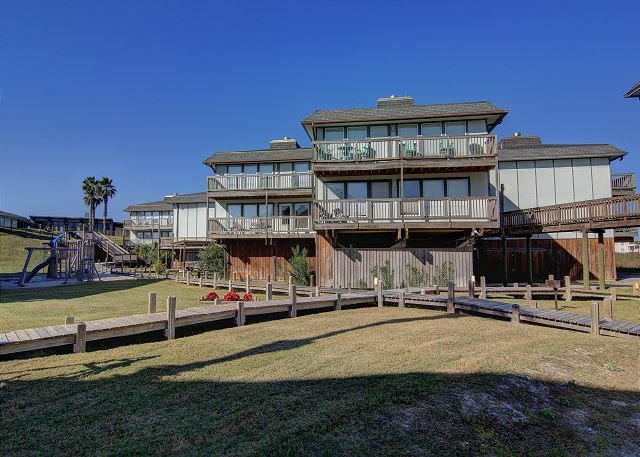 The property managers, Port A Escapes for amazing to work with. Harry is now my personal "Escape Artist"! we love it. and will come back had the best time ever. This rental was in a great location in town, had a wonderful balcony and plenty of indoor space being a two bedroom, two bath. It would have been helpful to have better signage from the road and also to have hand soap in the unit, even if it was a very small bar rather than two make-up remover toilettes. We are a family of 5. 3 kids. We LOVED this condo. The location was perfect for nightlife and also the beach. This complex was very clean with all the amenities. 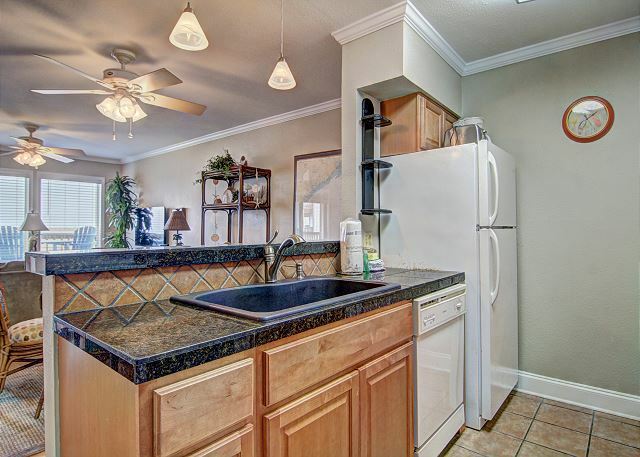 The condo was clean, with great appliances and furniture. 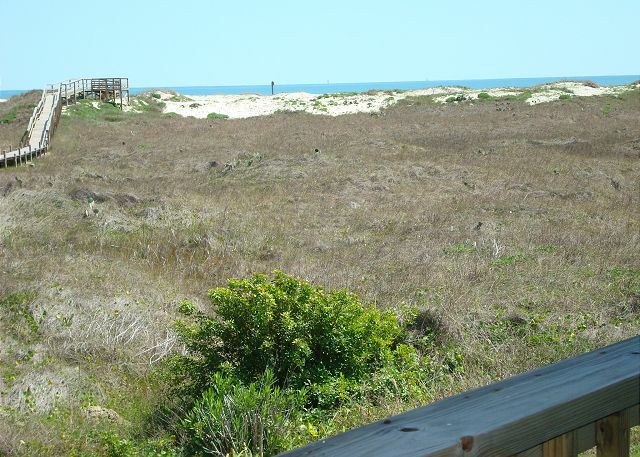 I loved sitting on the back porch and seeing the ocean over the dunes. Will try and make it back for sure! We had a wonderful stay. We stayed in another unit in Beachhead a few years ago and liked this unit much better. It has lots of nice updates (master shower, kitchen). The only thing we didn't like was the slow wireless/internet speed. 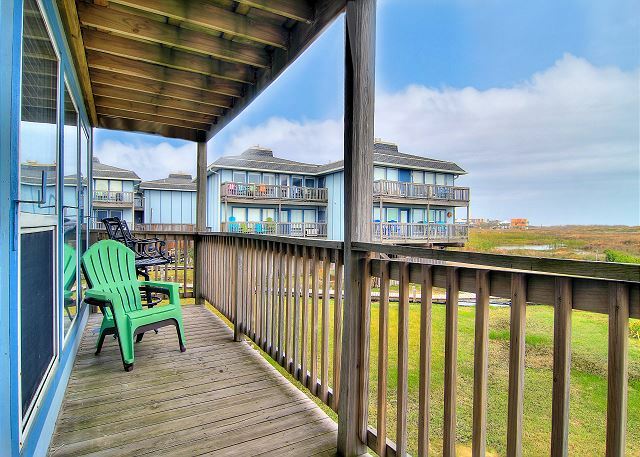 Overall this is a great place to stay--private boardwalk with short walk to the beach and a great view. I already miss the sound of the waves!! We had a wonderful time with some friends! 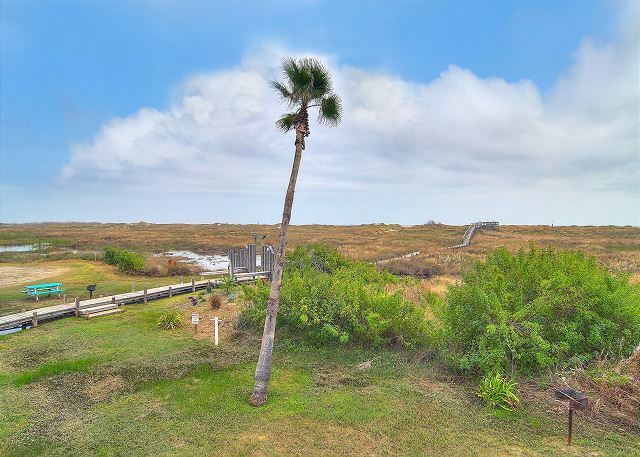 It was a perfect location, beach access was a 3 min walk by a boardwalk. The condo was comfy and clean. We will definitely be going back! 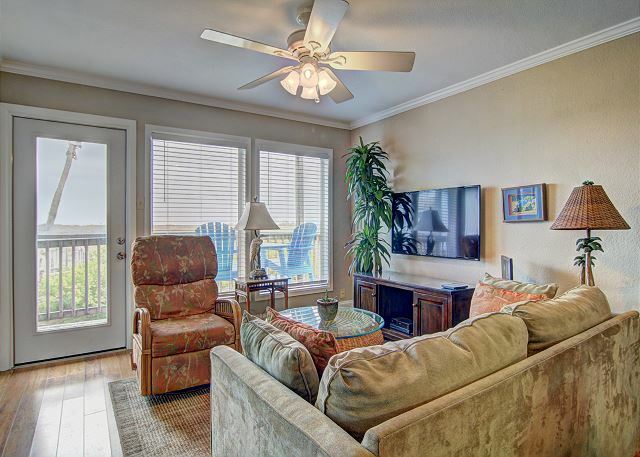 We enjoyed our stay at the Beachhead Condos... the condo was roomy, very clean and especially convenient. 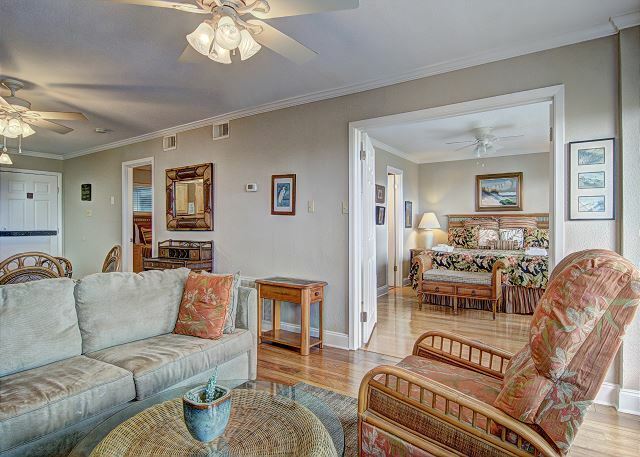 We enjoyed a great location and a lovely rental unit. The property was accurately described by the management team. 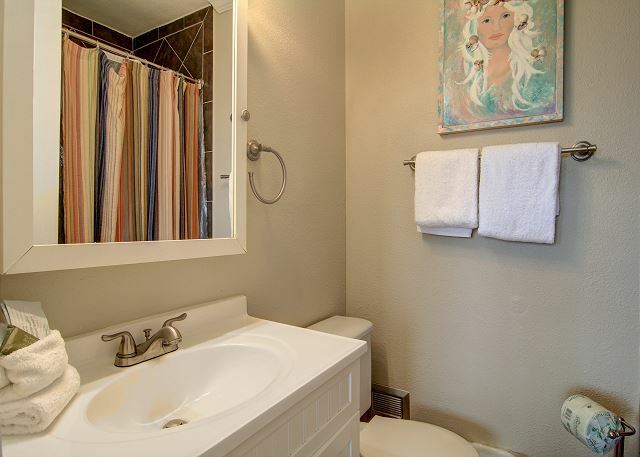 It was very clean and the décor was new. Our girls' trip + Marshall was fun. The only problem was, we needed to stay another day because we didn't have enough beach time, but then, it's never enough. We have stayed at Beachhead most every summer since 1986 or 87. Always a good expierence. The only problem is that the rates have gone up so much that we may need to find another alternative. Master bath shower had no hot water. No garbage disposal. This was a really great condo !! Thank you. Great location and beautiful view! Palmilla Golf and Resort very close. A really challenging and fun course to play. Stayed at Anchor's Away during the 2014 Sand Festival. The property was clean and comfortable. The only problem we had was the lack of seating for 4 adults. The condo advertises that it sleeps 5 and there are 6 chairs for the dining table, but only a loveseat and one armchair in the living room. We had to bring a patio chair from outside to accommodate seating for all 4 adults. Other than the seating problem, we had a lovely time and would stay in this complex again. Spent 6 weeks in Port A to escape the winter weather back home. Second year @ Beachhead Condos. Love the location. Unit was very comfortable, staff was responsive to our needs. We will be back. We had a wonderful time, despite the rainy cold weather. The condo we stayed in was very comfortable and highly enjoyable. The beds were all very comfortable and we slept great. We will definitely recommend this location and will be returning in the spring. I can't say enough about it! Great! Great! Great! Originally had us staying in 502 but the room smelled of stale cigarette smoke. We were not happy. We got moved to room 503. The room was great and made our stay a happy one. The management was more than helpful in making our stay a comfortable. I can recommend Anchors Away - Clean - close to beach and shopping. I really loved this unit. The view was perfect. I liked the updated space with nice furnishings. The only complaint with the unit were the beds. I am not a fan of soft beds, so it hurt my back to sleep on it. I am sure other people like the soft beds, so this is purely personal preference. The other issue I had was the late check-in. There was not an address given for the unit (on any of the paperwork). I had to figure it all out in the dark at 8:30pm. Also, not a fan of the lock boxes. Took us forever to figure out how to open them. Our little excursion was a pleasant and relaxing getaway for our family, just long enough for us to forget the real world for one day. 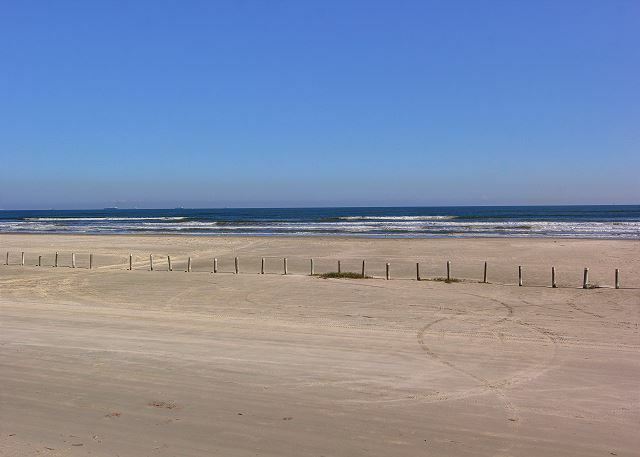 We love the Texas coast, the one thing that could have made it better would be and extra T.V. for the kids in the bedroom to watch while the adults watch and converse in the living area watching adult programs. Next time I'll ask in prior to reservation, other than that great place! We'll be back. My youngest son, three grandsons, and myself spent 3 nights here in November. Everything was great except for the weather and fishing. The condo made it a great weekend for us or it would have been awful. Proximity to the beach and the rest of PA made it great. We will be back. Serendipitously found the best condo in town! We only went off of internet reviews and images of condos for rent, and were shocked to find out how great this place is once we checked in. Lovely exterior, great location, and amazingly new and clean interior. Further, we were the closest condo to the beach out of the whole complex and had an ocean view! Great place and will stay again. Perfect for a beach vacation. This is a great location for a beach vacation. Everything in the condo was great. Slight problem in the master shower was reported and will hopefully get fixed for the next users. The members of my staff that stayed in the condo were happy with its size, amenities etc. Beachhead 503 was the best! 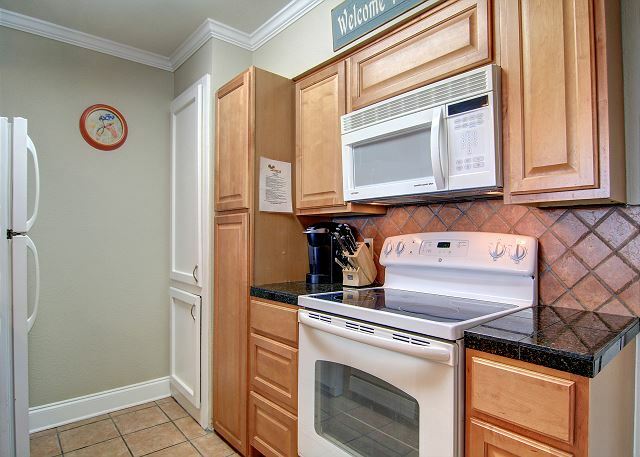 The remodeled kitchen and baths were beautiful! The high directors chairs on the porch provided the best view of the beach! The recliner was in a perfect spot by the window was so comfy! We are definitely requesting this room next time we visit! 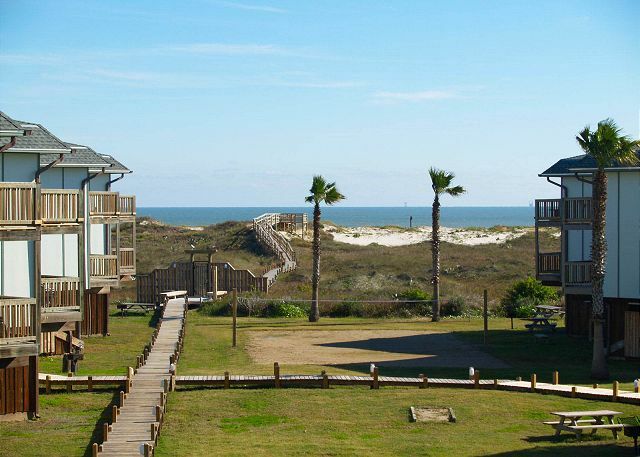 I have chosen this same unit for two years in a row for its proximity to downtown while still being able to see the water after looking over the dunes. 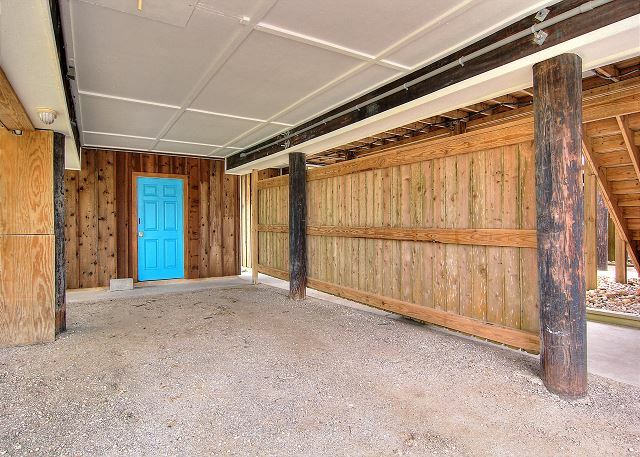 There's nothing fancy about this property, but it has everything you need. The dedicated parking spots are nice, too. THe coffee pot did not work. Clled the office and the gentlemen I spoke to said it would be replaced. It never was. Also the WiFi didn't work. Between 3 smart phones and One Laptop none of use to hook up to the wifi. Checked in on Sunday, left Friday. I liked the condo being on the end closest to the beach. It was furnished nice and the four of us had a great time just relaxing. December is a slow time of year so never had to wait at a restaurant for dinner. There were some restaurants closed and only open on weekends but we found plenty open during the week. Will come back again this time of year. Nice place to rest & catchup on your reading. Great Stay in Port A! 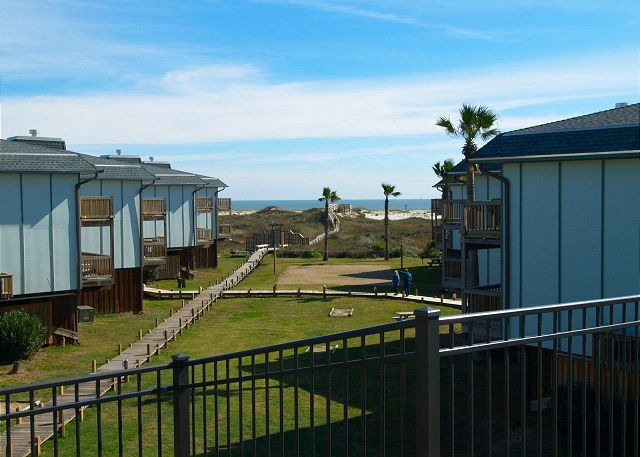 We had a wonderful time in Port Aransas. The condo was awesome and we would definitely recommend it to anyone. We brought our grandchildren for a getaway and quality time. No television, no electronic games. We enjoyed swimming, walks on the beach at night,the pool, bbqing, and playing games. Everyone had a great time. Thank you. The only thing that would have made this rental better is supplying towels we only had 4 towels in our room and were told that no daily clean towels would be provided, so the continued use of the washing machine was needed. It would be nice to have the towels supplied again like they were in the past. Location of this unit was great. 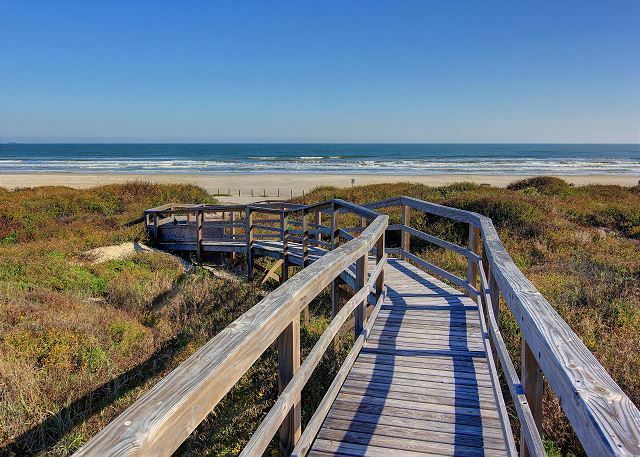 Beautiful view of the ocean and easy walk to the beach. Unit was great and good size. The property was perfect size for our family of four. 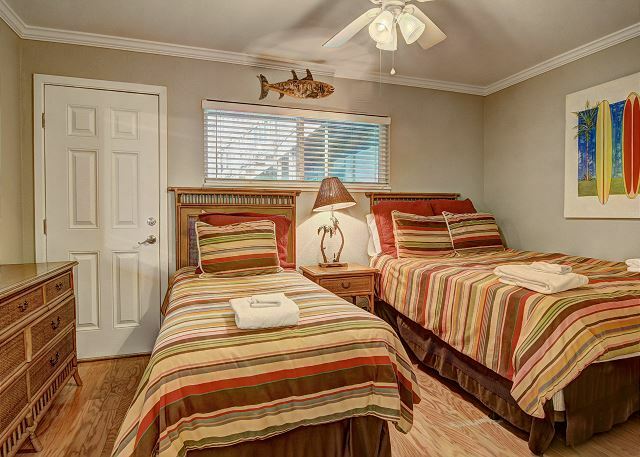 Close proximity to the beach and nice pool a short walk away. Beds were comfortable, kitchen okay (bring your own specialty utensils or cookware). Items to note: this is a second floor property; there is a door leading to outside in the kid's (2nd) bedroom - we just blocked with the dresser. Great location. A little small, bathrooms, kitchen. 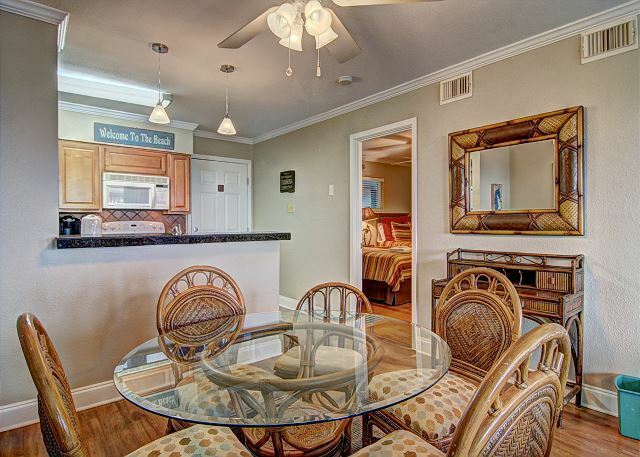 This condo was by far the nicest place we have ever rented in Port A. It has been nicely updated and has every upgrade you would want. The view was fantastic and the location was perfect for us. Our bed was very comfortable and even our bedspread smelled lovely. The gentleman at the office who booked our stay made the process a breeze. All in all, we never want to stay anywhere else. The unit was Ultra nice with updated furnishings. Kitchen was nicely stocked. Overall things were great. We are a family of 4 (children aged 4 & 9). Stayed for 4 x nights in Jul. Booking & check in could not be easier - no hassle, no delay, easy to find. Condo clean and exactly as pictured on the Website. Walk to the beach literally 5 mins - very safe beach, no rip tides and sandy all the way. Local area has plenty of good places to eat. We choose not to do any activities (trips etc) as the kids were so content on the beach. Ease to and from beach meant we could come and go during the day (leaving the chairs etc on the beach), which allowed us to get the kids out of the sun for a while and grab a beer before heading down for sunset and a night walk. In summary our very active kids loved the beach and the sea, and we relaxed more than ever because in terms of parenting this is easy money - loved it! The renovations to the condo were beautiful &amp; our family LOVED staying there. The only thing that needs improvement is a maid service to provide toilet paper, clean towels daily and trash pick up daily with new bags provided. This was our second visit to Beachhead. This room was by far our favorite. It was very comfortable and welcoming. Can't wait to get back there! slept, but we move the dresser against the door and it was not a problem. We all had a great time staying at Beachhead. 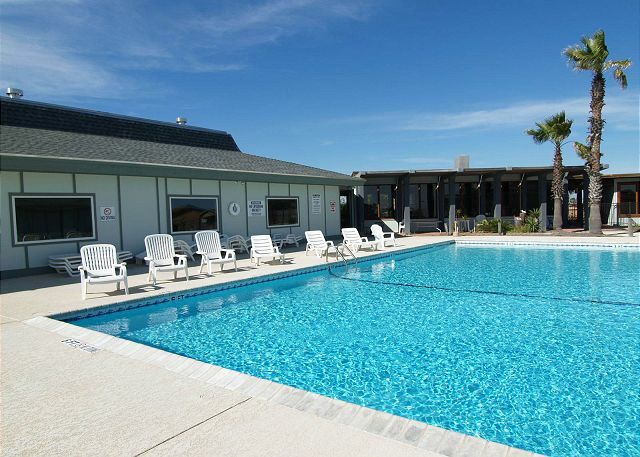 Clean condos, very nice staff, and was easy to walk down to the beach or swim at the pool. Very relaxing and can't wait to come back. Our first family vacation since we had our kids, who are now 2 and 4. We were nervous traveling away from familiar places with the girls, but the condo was wonderful. The property was great and we will hopefully be returning next summer. 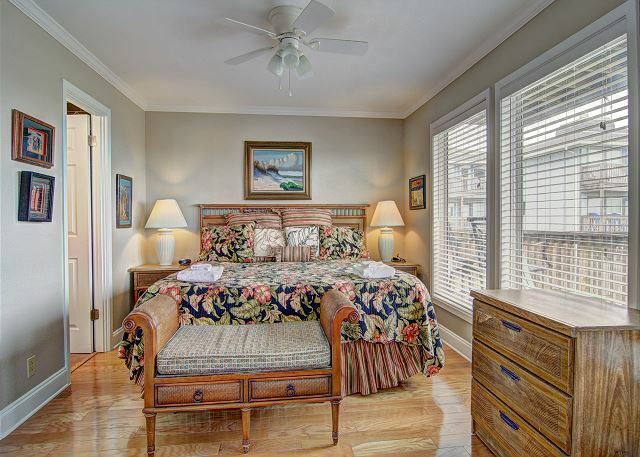 The property was beautiful, clean and the managing staff was very helpful. We were disappointed on arrival to find that the spare bedroom had an outside entrance, as we have young children. Also would have liked high chain locks on the doors so it wasn't as easy for the kids to exit the condo. This week at the Beachhead was actually purchased as a gift for us by a dear friend of ours. They felt we were in much need of some down time. We stayed the first week of January so we're sure it was quieter than summer high time but it's just whatbwe needed. It was wonderful, quiet, and peaceful. Please note: We are actually from Houston not Austin like it says below. 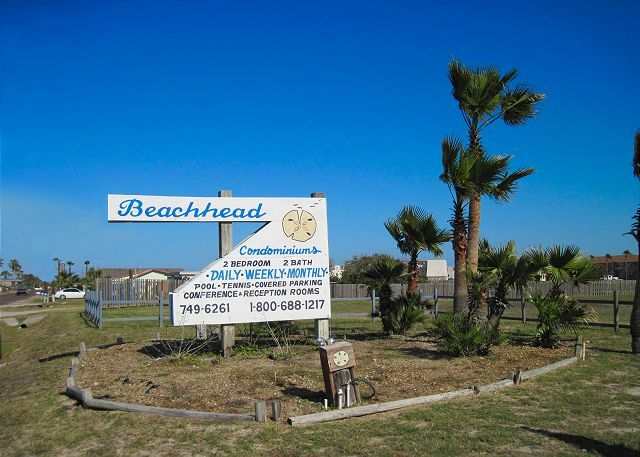 Our first visit to the Beachhead was 11/77. A favorite escape place for us for many years. The renovation is great - our condo had a very special touch. Thoroughly enjoyed our Thanksgiving Holiday. Port A Escapes was great to work with. The only thing we were disappointed in was the veiw of the dunes - we would have liked to see more water from the balcany. The condo was very nicely decorated and comfortable. Location was in town and convenient to everything we wanted to do. Would have liked to have had tv's in both bedrooms. This property may have a mold problem that needs to be checked out. Overall, the condo and our stay was very nice. A wonderfuk place to stay and enjoy the coast. A very good location centrally located. We have been staying here for over 20 years and you have made it even nicer! I absolutely loved "Anchors Away" - it was neat and tidy and clean, and had plenty of room for my sister and I and our children. It was close enough to the beach that we didn't have to drive - we were able to carry our chairs, canopy and cooler down the boardwalk to the beach. The balcony was very nice - we had a picnic lunch out there and enjoyed the sounds of the ocean. I would definitely stay here again, and I would definitely recommend it to anybody! The value for the price was excellent! My children and I stayed in this condo for 3 days and had no issues whatsoever. 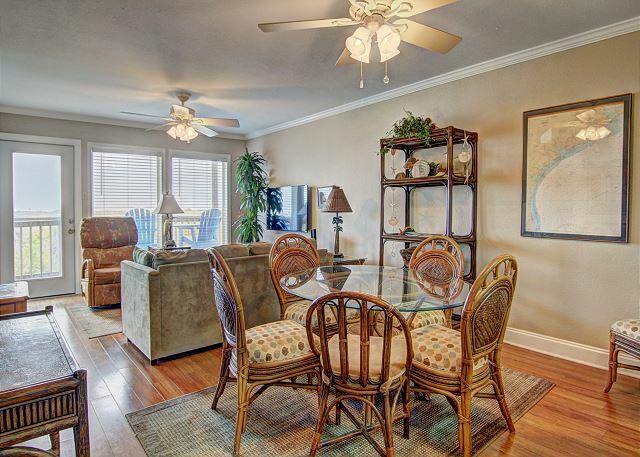 The condo is tastefully furnished, clean and the location is great! Probably the only suggestions I have are a larger skillet and more trash bags; however, the absence of these items did not detract from our overall enjoyment of this property at all. I highly recommend this property and look forward to booking it again for future stays. My family and I took an early summer vacation at Port A on June 10. We stayed at Beach Head 503BH. 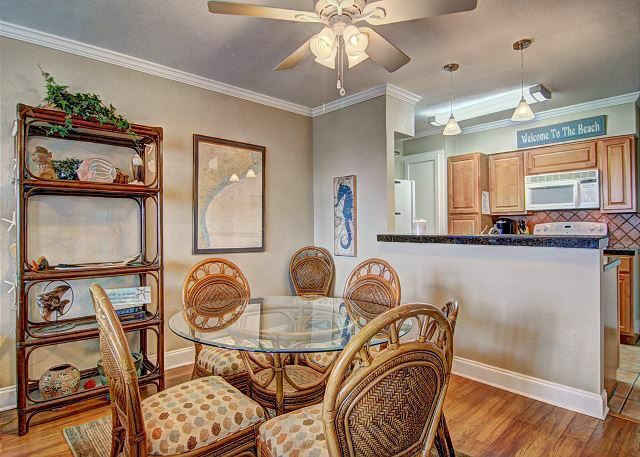 This condo is very nicely decorated, clean and very comfortable. It appears to have recently been painted and the flooring and carpets look new. For a family or two couples, it is ideal. The beds were comfortable and the bathrooms convenient and well-designed. 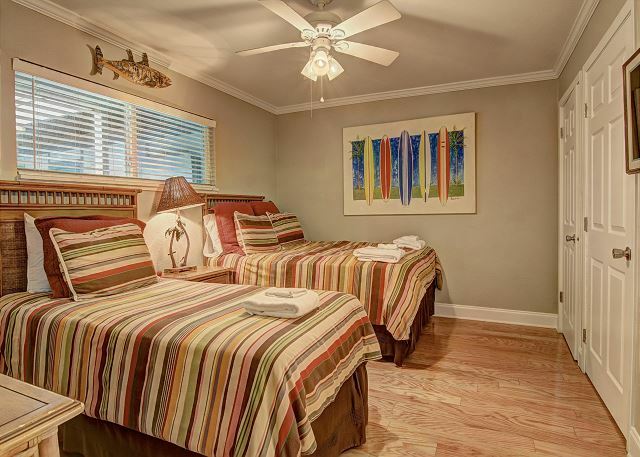 The condo has a queen size bed in the master bedroom and two twins in the second bedroom. There is an airbed for additional guests and a couch (not a hide-a-bed!). The parking spoace is close to the unit and very wide. 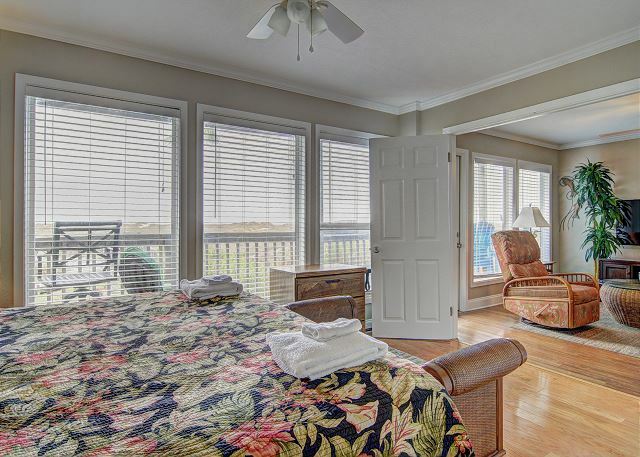 This unit is on the second floor and has a balcony which is great for enjoying the view of the ocean. Highly recommended. The facilities and rental property were awesome. My only regret was that there was nowhere to wash and dry your towels. We had a great time and we loved the new updates to the condo.